Professor Cristobal Uauy, who is a project leader in crop genetics at the John Innes Centre in Norwich, described the pinpointing of wheat genes as "a game changer". 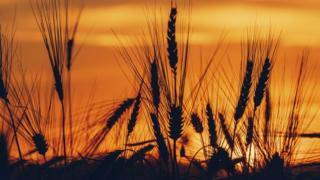 "We need to find ways to make sustainable production of wheat in the face of climate change and increasing demand," he told BBC News. "This is something we've been waiting for for many years. The whole of human civilisation should be very excited with this because for the first time now we'll be able to make the advances that scientists and plant breeders have wanted to do in wheat in a much more targeted manner and so feed the world in the future." The UN's Food and Agricultural Organization (FAO) estimates that wheat production needs to be increased by 60% by 2050 to feed the population, which by then will have grown to 9.6 billion. Much of this work is being carried out by the International Maize and Wheat Improvement Centre (CIMMYT), based near Mexico City. It is an organisation devoted to developing new varieties to boost production for farmers in some of the world's poorest countries. For decades CIMMYT has been trying to increase yields and stave off new strains of diseases by releasing new varieties created by traditional cross breeding. But the expected increase in heat waves caused by climate change has now made the development of varieties that need less water and tolerate higher temperatures their top priority, according to CIMMYT's head of wheat research, Dr Ravi Singh. "During the critical few months of the growing period if you have a one degree rise in night temperature you lose 8% of the yield, so climate resilience is one of the major factors in our breeding programmes," he said. Scientists develop thousands of new varieties of wheat each year using traditional cross breeding, where traits are selected for by eye. The process works well but it is painstaking and expensive. It is also a numbers game because each time varieties are crossed it is a lottery as to whether the resulting crop has the correct combination of the desired genes from the parent strains. It can take between 10 and 15 years to develop a new variety and have it in a farmer's field. Researchers have now identified more than 100,000 genes and their position in the DNA of wheat. They have in effect produced a map which shows and labels all the most important places on the wheat genome. By knowing where all the genes are, researchers will now be able to discover how they work together to control traits such as drought resistance, increased nutritional value and higher yield. And by using gene editing techniques they can add the traits they need more quickly and precisely. Do they really need to use gene editing? Critics of the use of gene editing to boost production argue that there is sufficient food in the world. The problem is that it is not distributed to those that need it. The director of CIMMYT's global wheat programme, Dr Hans Braun, agrees. But he believes that a political solution is much harder than a gene editing one. "For example in North Africa and West Asia, wheat accounts for between 40% and 50% of all calories. It is absolutely highest priority for national food security for countries in the region to produce enough wheat. They import a lot already and the more the more they import the more they are dependent on other countries," he explained. Dr Helen Wallace of the campaign group Genewatch UK said that researchers should be careful not to "over-promise". "In reality, what gene editing can deliver will be limited by the complexity of wheat and its environmental interactions, " she said. "Altered nutrition, for example, can sometimes make a crop more attractive to pests, or have adverse effects for some people eating it. Strict regulation, traceability and labelling will be key to protecting the environment, health and consumer choice". The gene map for wheat is a result of a mammoth effort by two hundred scientists from 73 research organisations in 20 countries. Together they have identified the composition of 21 wheat chromosomes and the precise location of 107,891 genes. It has 16 billion separate chemical building blocks of DNA - which is more than five times larger than the human genome which was completes nearly 20 years ago. As if that weren't enough of a challenge, wheat has three separate sub-genomes. This has made it difficult for scientists to distinguish each sub-genome and to put them together in their correct order.